TEMPTATIONS® DENTABITES® Oral Care treats is rated4.7 out of5 by70. Rated 5 out of5 bySYDNEYCON_3751281631 fromWith three picky adult cats, treat time at my home can be a bit of a hassle. Normally each cat will only eat one select treat, leaving me to haul out three bags anytime I want to reward them. When I shook and opened the bag of dentabites, I was surprised to see all three waiting patiently. I gave them each one, and to my greater surprise they all ate one! It hasn't been long enough to see results in their teeth, but so far neither of them have turned up their noses at the new daily treat. I'm happy that the one treat they all decided on was for their teeth! Rated 5 out of5 byMithra fromThrilled CatWe have a slender-bodied (which means ''skinny'') Cornish Rex, and a plump domestic short-hair, both Digby and Pepper are thrilled when the Green Dentabites. In the Morning, they will stand eagerly on the kitchen floor staring up at the cupboard where the package is kept, and the pleading expressions in their eyes makes their yearnings clear. We are very pleased to have such a healthy and low-calorie treat to bring them such easy joy. Rated 5 out of5 byCHRISTIECON_3751282967 fromMy cat always comes running when she hears a Temptations treat bag being opened. She loved these ones and ate them up right away. I like that they are crunchy and good for her teeth and gums. I have to watch that she doesn't eat too much and gain weight so I like that these only have 2 calories per treat. I also like that they do not have a strong smell! I would definitely recommend these for your cat. Rated 5 out of5 byCRYSTALMBC_3751283603 fromMy kitty loves the Dentabites the best out of all the Temptations Treat's. 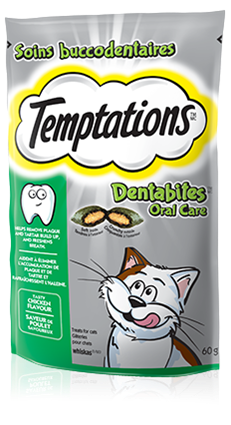 I like that they are more than a treat; that they help keep my kitty's mouth and teeth clean. They are also larger than the other Temptations Treat's, I think he likes that. I notice that when my kitty gives me kisses, his breath doesn't smell at all . Thanks Sample Source and Whiska's !!! Rated 5 out of5 byCatmom from4 Paws Up!! !My 7 year old cat had her teeth cleaned at the vet last week. She had some pretty serious tartar going on. A couple of days later I saw the Dentabites in the store and decided to give them a try. I was concerned she might not like them, but she LOVES them. She keeps begging for them. I'm really hoping they will do a good job of keeping her teeth clean. Rated 5 out of5 byAMANDALON_3751406825 fromMy cat goes nuts over these. The sound of the bag has her running over and I've even caught her trying to get in the cupboard I keep them in. She's addicted...it's cute :) I can't tell yet if the dental benefits work, but assuming they do I'd choose that over regular treats for sure. Rated 5 out of5 byALEXANDRAVON_3751277934 fromMy cat loved these treats. I use them as a reward for letting me trim her nails and it has truly made the process go smoother (she doesn't hate me for hours after anymore). She is overweight so knowing these treats are low cal and healthier are a huge plus. Would buy again!